I love my sister, Laura. After 34 years as a school social worker, she’s finally retired. Part of her bucket list is to attend the annual Martha’s Vineyard Agricultural Society Fair in late August. Previously, this wasn’t possible because she always had to be back at school in the early part of that month. This year our families’ summer trip to the island will include experiencing the charm of the Ag Fair for the first time. 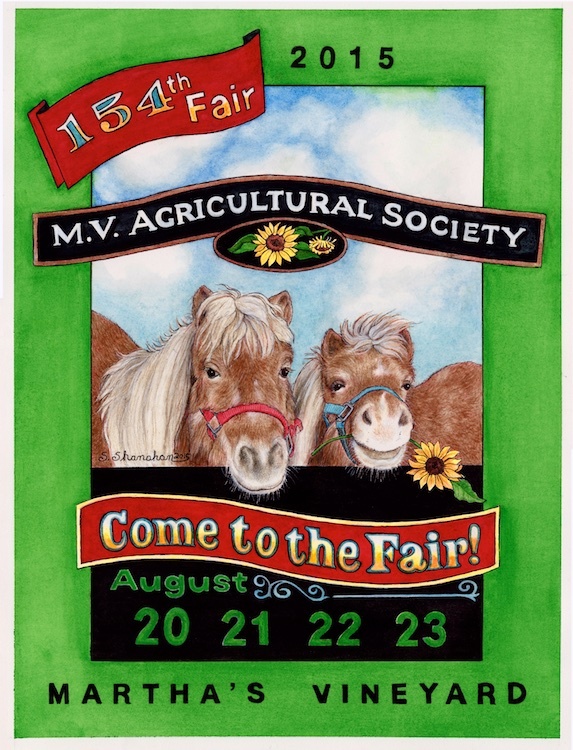 Last March, when Laura read about the Ag Fair poster contest, she urged me to enter. If I won, it would be so much fun to see posters, featuring my art, hanging all over the island to advertise the fair. 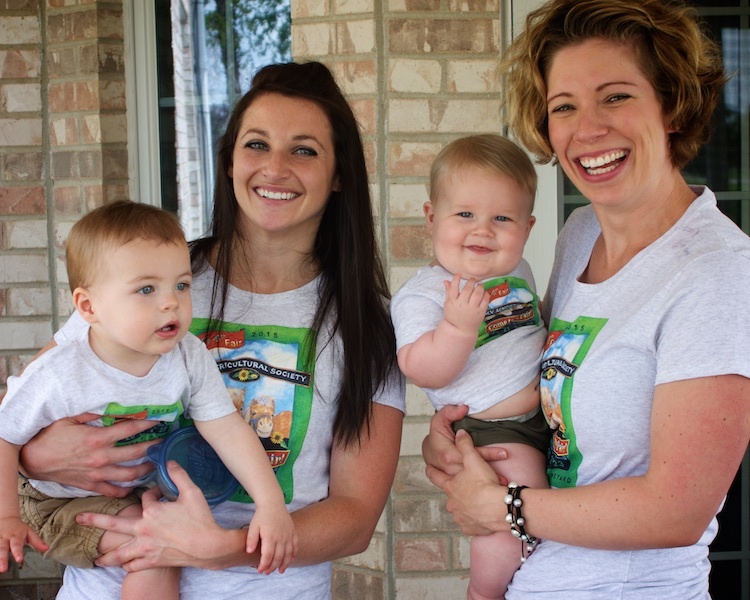 I was already envisioning how cute my grandsons would look wearing t-shirts displaying my design. The best part of all would be giving the framed original to my sister as a retirement gift. I worked around the clock on my illustration to get it to the judges before the April 1st deadline. I was pleased with what I came up with and felt I had a real chance of winning. On April 7th, I got a call letting me know that although my entry was a runner up, it wasn’t chosen to represent the fair. At first, the news stung more than a little bit. After awhile, it came to me that this was not a loss. Granted my poster won’t be showcased around the island, but who cares? The important thing is the original art would be hanging on Laura’s wall. I knew all the hours spent creating it would make it even more special to her. As for the t-shirts? There was nothing stopping me from having them made for my favorite people, so I did. Today, I’m even more sure that even though the poster competition didn’t go my way, it still worked out perfectly. None of our efforts in life are ever wasted. We can’t always see the reverberations of good intent, but they ripple forever outward just the same. Doing something out of love for another is no small thing. Winning and losing are all a matter of perception. Getting a good photo of my grandsons wearing the Ag Fair t-shirts was harder than I thought. My poster was designed around a snapshot I took of the ponies that live down the street. 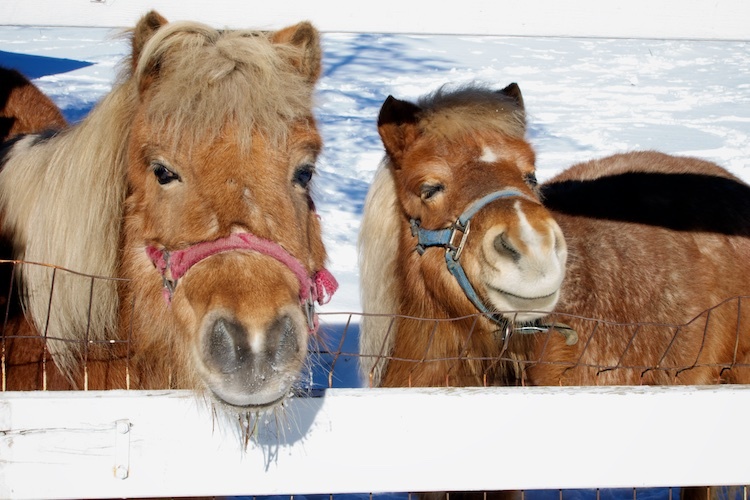 I love the poster…the expression on the ponies’ faces. The t-shirt was a brilliant idea. Thank you! Seeing my grandbabies in the t-shirts makes me so happy. Love the t-shirts you art is always a winner in my eyes. I think your poster was great and I too, loved the horses faces – so complacent, so relaxed, no worries! And the photo of your GRANDS and their mommys in the shirts is really awesome!! YOU DID GOOD, SUE! I love how you approach live with such an uplifting attitude! Thanks for sharing your story AND your attitude with us! Sue, I forgot to say that your grandsons are darling – I love the younger one with the big grin and his chubby tummy sticking out under the shirt! And to make corrections MOMMIES and LIFE. I sure would like to see the winner, as your poster is fantastic! Your written thoughts are always so inspiring and your talent such a gift to us all! Love the photo of those darling boys and their wonderful Moms. You’re always a winner in my book!! And your illustration/poster is fabulous. Oh Sue, I tell you, that little fella with his belly so round is SOMETHING. Oh, just look at the glee in his eyes!!! Makes me just want to giggle and look again, and giggle all over. He’s really chuffed wearing Gram’s creations. That nothing done out of love is ever wasted….that’s a reminder we could all do with. These past months, “Nothing is ever wasted” has resonated time and again with me. It reminds me not to despair over unanswered prayer. Helps me keep the faith. And it certainly reminds me not to play God, there are other things for me to do. I still do have “poster-runners up” days, and take longer to get over than you did, but like you said, when done out of love, it’s never lost. I love you! Thank for reminding me of what I wrote.